Horses have long been my inspiration for not only writing but for life in general. Horses are healers and my years working for PATH, the Professional Association of Therapeutic Horsemanship, brought that home to me. The Mustang mare in In the Heart of a Mustang is a healer for the troubled high school-aged protagonist in the novel. I also enjoy training horses…as much out of necessity as desire! I can never afford to buy a trained horse so I have to do it myself. I attended two Clinton Anderson training clinics to get my material for this novel. There is a lot of horse training in the book. This novel is a new venture for me. For my other fiction novels, all middle-grade fantasies were published by small publishers. These fun books titled Behind the Mist, Mists of Darkness, The Rising Mist and North Mystic, have all been honored with national awards, However, I decided to start my own publishing company to produce In the Heart of a Mustang so that I can have more control of both design and pricing. I am calling it “Dancing Horse Press.” Isn’t that a cool name? I discovered that while I learned a lot working with publishers, my compensation was very low and I was still required to do all the marketing myself. The other authors that I network with have been filling me in on the resources now available to authors who want to try publishing themselves. I am having fun learning new things. It is a new world out there for authors! I am quite sure I would not want to jump into the world of my favorite book! While I have lots of books that I love, the one that comes to mind is The Hiding Place by Corrie Ten Boom. This inspiring, true story about a Dutch family that hides Jewish people during WWII and ends up being sent to a prison camp is very powerful. I would like to have the faith of Betsy. But I am grateful that I haven’t been in that situation. As I mentioned, my biggest project right now is setting up my own publishing business. If it works well, I will publish my next project through Dancing Horse Press as well. The book I am currently working on is the first book of a four book series titled The Centaur Chronicles. The first book is The Stone of Mercy. I am returning to my love of fantasy and horse-inspired fantasy characters. I am loving the book and almost done with the first draft. The second in the series will be The Stone of Courage. Maybe that I am so short until I’m on a horse! What is the most important thing being a writer has taught you? Writing is about 10% talent and 90% old-fashioned hard work! If you want to write, you need to put the hours and hours of time in front of a computer that it takes to complete a book. It is very addictive for me so I don’t mind. I think I would be lost without this type of creative outlet. Sometimes I even choose writing over riding…though not often! If your book were made into a movie, what would the tagline on the poster say? 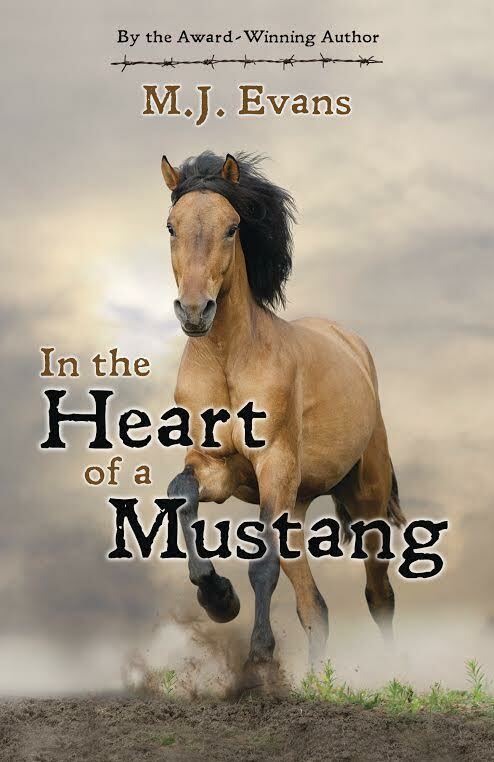 In the Heart of a Mustang will be released on Oct. 5th. A boy is told that his father was a brave and virtuous man, a soldier who traded his life to save the lives of countless others. He was the man that Hunter needed to emulate. The only problem is the whole story is a lie, all of it. The truth, which Hunter discovers as he begins his sophomore year of high school, is that his father has actually spent the boy’s entire life in jail, paying his debt to society, but not mending his ways. A wild mustang mare, is rounded up by the BLM. The spring rains had been sparse, the forage on the plains even more so. The mare and her herd are rescued from certain starvation and placed for adoption. In a sandy corral at Promise Ranch, a home for troubled teenage boys, the boy and the mare meet. A weathered, old cowboy brings them together – a mentor for one, a trainer for the other. M.J. Evans is probably the only author who has ever done a book signing from the back of a horse! Her passion for horses and writing have been combined in most of her books. 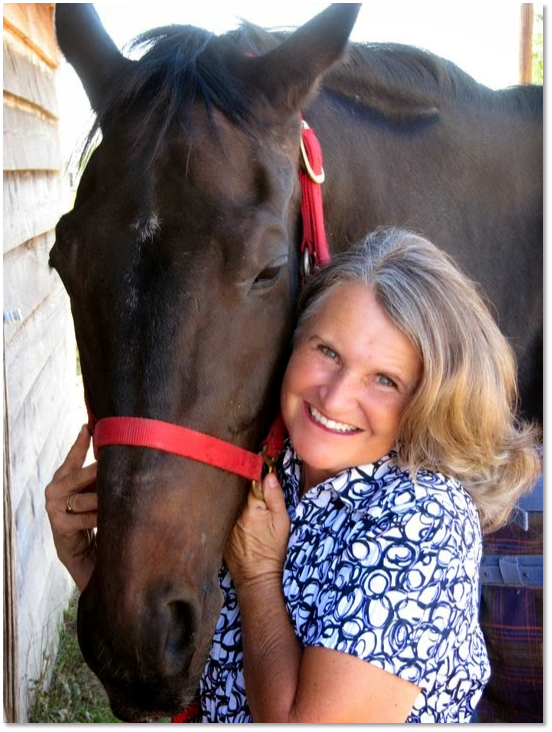 A life-long equestrian, she has written three equestrian trail guide books for Colorado, an award-winning fantasy trilogy titled "The Mist Triology" about the noble and great horses who are chosen to become unicorns when they day and, now, her newest release: "In the Heart of a Mustang." The author is a former teacher of middle-grade and high school courses, the mother of five and the grandmother of ten. She is a graduate of Oregon State University and now lives in Colorado with her husband of forty-three years, a standard poodle and three horses!